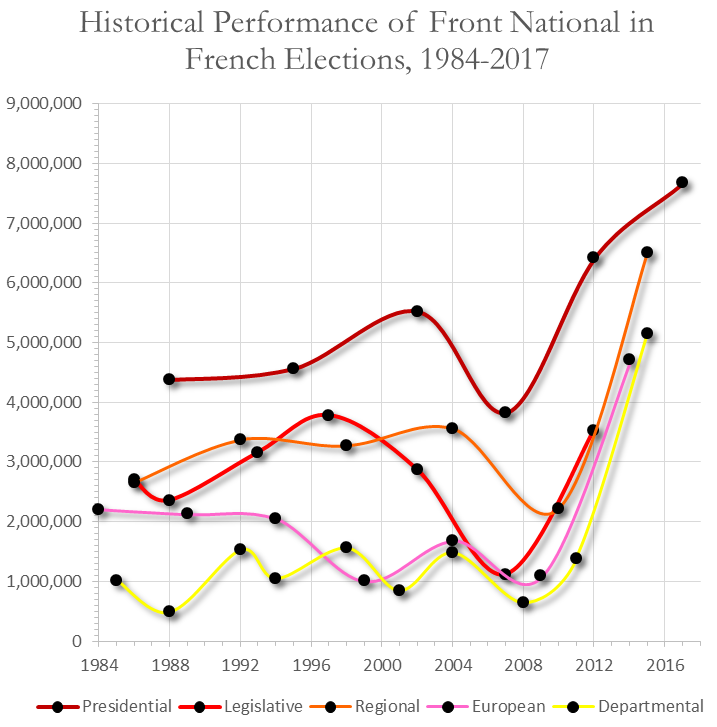 One of the reasons that I consider the results of these elections to have been strongly disappointing for the Front National is that it represents not just a stunting but a reversal of their upwards trend since the late 2000s. For instance, back in December 2015, the Front National almost doubled their share of the vote in the regional elections relative to 2012 (and a tripling relative to 2010). Even though they failed to win a single region, it represented a strong surge that seemed to augur very well for the future. One encouraging thing from 2015 was that support for the FN was highest amongst the young age groups: 35% amongst the 18-24 years olds, versus ~30% amongst the 25-60’s and 20% amongst the over 60s. This seemed to represent a general trend across many European nations where “conservatism” amongst the older generations (which is “Communism” in Russia’s case) transmutated into nationalism amongst the younger generations. Now, this trend has come to an end in France, and has even begun to reverse. In 2017, the most avid supporters of Le Pen are the 35-49 year olds, falling to 24% amongst the 25-34’s and to 21% amongst the 18-24’s. Now yes, to be sure, there is a Muslim/immigrant demographic effect here, which does somewhat dampen the nationalist vote amongst the younger generations (though this makes it no less electorally real). This is because of the well known fact that Muslims are much younger on average than France as a whole. 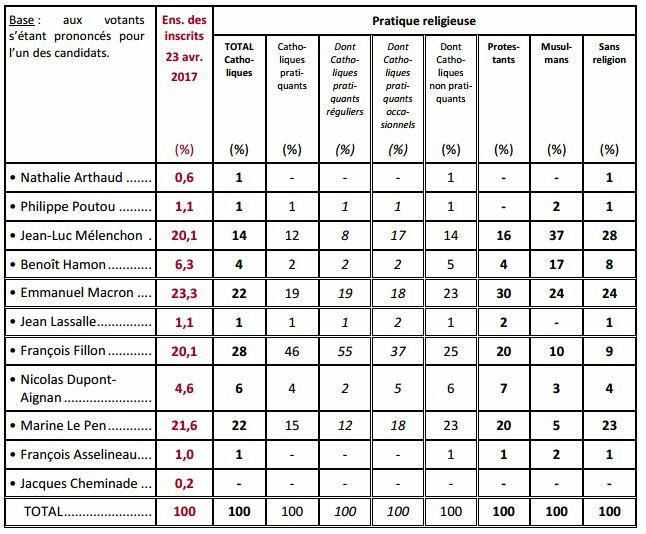 According to a recent IFOP poll (see right), the far left Melenchon enjoys almost twice as much support from Muslims as he does from the country as a whole; another 17% of them support the socialist Hamon, three times as much as his all-country average. Conversely, only 5% of them vote for Le Pen, versus 21.3% overall. And indeed, it is perhaps a telling coincidence that whereas Le Pen’s support falls by 8% points from the 35-49 age group to the 18-24 age group, conversely, Melenchon’s support increases by the same amount. Still, even the youngest voting generations outside the Île-de-France are still solidly majority French, so the Muslim factor can only account for a minor part of the difference. The logical conclusion, then, is that Le Pen has simply stopped growing on the youngest generations of ethnic Frenchmen, if not gone into outright reverse. For any French or European nationalist, this is doubleplusungood no matter how you spin it. What makes this even worse is that I don’t think this is explainable on account of Marine Le Pen’s antipathy towards the EU or her statist economic program (as argued by the Russian liberal nationalist Egor Prosvirnin, who has mocking called her Marine Ivanovna Kurginyana). Again, as with Russia, the trick is to look at the opinion polls. According to this IFOP poll from April 2017 (see right), there is hardly any significant difference in support for the EU (specifically, agreement that France is stronger by dint of its membership of the EU) across different age groups: 69% for the 18-24’s, ~60% for the 24-65’s, and 68% for the 65+s. However, there is a clear separation across party lines: Whereas 80% of the mainstream political forces support the EU, and 60% of Melenchon’s leftists, for the FN/Le Pen this figure is just above 20%. She is not going to get trainloads of Parisian hipsters hopping aboard by reversing her policies on the EU. 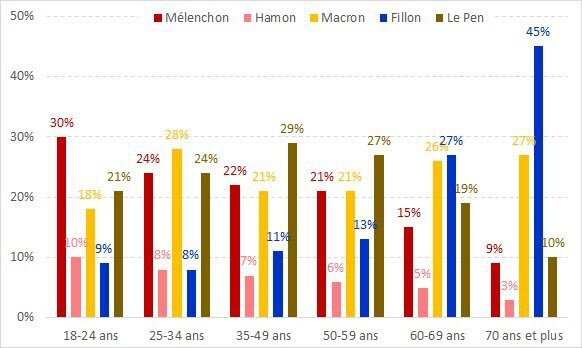 As regards economic policy, consider the basic fact of the election itself: The “neoliberal” candidates, Macron and Fillon, got 67% amongst the oldest age group, versus 27% amongst the young; in contrast, the basic income supporter Hamon and the commie Melenchon got 40%. In tandem with the observation that the French have always been one of the most anti-capitalist nations, more so than even Russians, and considering who forms the core of the Front National’s support – blue-collar workers in the depressed post-industrial towns of the North-East rustbelt – it is absolutely clear that any significant shift towards a more neoliberal economic platform would be a disaster. Note that all this is quite independent from any discussion about the purely economic merits of this or that economic platform. 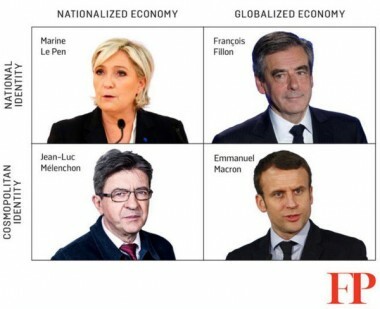 I would only make one last point that Le Pen’s economic platform is actually quite moderate in comparison with both that of Melenchon and Hamon. Ultimately, I think Le Pen is just playing a bad hand just about as well as she could. Its just not enough to win this year, and I am now skeptical about 2022 as well. Because in the end, a 2-7 offsuit will lose against any other hand. That losing hand is the mentality of the French themselves, who have decided that one dead immigrant child washed up on their beaches through the neglect of his own parents is worse than having dozens of their own children blown up in the theaters of Paris or mowed down on the streets of Nice. There are only one or two more decades left in which the French could continue indulging their ethnomasochism. After that, the preservation of the traditional French way of life – at least through democratic and constitutional means – will become permanently untenable. 60 Comments to "The French Blackpill, Quantified"
France as a sovereign nation must cease to exist. LePen does not have a particular edge as a candidate. She is not personally exciting. Her rethoric is cerebral (logical). Something more is needed to defeat the odds stacked against her. She is Hillary, but with the establishment against her. It is almost never about the issues. When issues matter, it is often the candidate that framed them in an exciting way. The grueling modern elections are about the character of the candidate. France is the urheimat of Enlightenment liberalism and concomitant individualism. For over two centuries many have believed that being French is a state of mind. This is a country that does not collect demographic information because they have willed it not to exist. The FN should propose a slow-down in immigration to allow assimilation and acculturation time to work. Don’t try to overturn the ideology of a significant fraction of the electorate. If you know you can’t get a full loaf, try for a half. It wasn’t even a French beach…or any other European beach. It was in Turkey. Which just makes the insanity even more obvious. Does anyone know why Brazil of all places is the top free market supporter in that last graph ? I would think that in Brazil, like in America, the idea of the welfare state would be opposed by the productive middle for ethno-racial reasons. The welfare state is more likely to get broad support in homogenous societies. Are we being a little too pessimistic? Had it not been for his personal scandals that made him lose a chunk of his supporters to Macron, Fillon might have reached the runoff and then be in position to defeat Le Pen. Fillon was fairly similar to Le Pen on the immigration issue I believe, at least in his rhetoric, calling for a national referendum to empower Parliament to restrict immigration. Sigificantly, it wasn’t these stances that cost France the chance for a Fillon Le Pen runoff but the afore mentioned scandals. At the start of the year, Fillon was the odds on favorite to be the next President. Fillon endorsed Macron, which means his position on immigration is either a lie or he thinks its unimportant, whichever of those two it is, it makes him the wrong candidate. As an American who very much likes France and wishes it well, I find this inexpressibly saddening, and somewhat surprising. I always knew that the French elites were rotten, traitorous, and short-sighted – almost all elites in the West are – but I always hoped that the French people, if given the chance, would repudiate this nonsense, a la Brexit/Trump. It looks like this was a mistake. Yes, the fish always rots from the head, but the rots also spreads downward, and it looks like this is what has happened here. This was predicted way before (decade, actually) Submission, which is derivative to Elena Chudinova's The Mosque Of Notre Dame De Paris. Sigificantly, it wasn't these stances that cost France the chance for a Fillon Le Pen runoff but the afore mentioned scandals. At the start of the year, Fillon was the odds on favorite to be the next President. I get the impression that the French centre right and the French centre left have essentially the same position on immigration: whatever is more tactically convenient for them at the moment. It's not important to them. Why exactly would Fillon endorse Le Pen when he could oppose her while stealing her positions? What would he or his party gain from essentially playing second fiddle to Les Nazis (pardon my nonexistent French)? They'd much rather it was the other way around, and if FN does plateau or decline from here on out, that's what they'll get under a Macron presidency, the chance to lead the soft nationalist opposition. I think it’s already impossible. Yeah, Fillon’s immediate endorsement of Macron was very disappointing. He didn’t even wait to see how his supporters felt about what he should do as the leftist Melenchon did. Melenchon is a very clever politician, I must add. His economics probably don't make any sense, I haven't looked at them, but who cares (other than those of the French who have a lot to lose)? Meanwhile refusing to endorse and letting "the movement" vote is just brilliant: lets him maintain independence and build up true democratic street cred, while preserving some impression of cohesion among his followers and a measure of deniability regardless of who wins. If only that fake socialist Sanders had been so clever! Has Mélonchon actually now endorsed Macron? Last I heard, he had told his supporters not to vote for Le Pen, but didn't tell them to vote for Macron. B) The nationalist minority has barely grown in 15 years. A significant white pill though: among the more agnostic normies, neither globalist Macron-supporters nor nationalist Le Pen-supporters, there is not the kind of truly hysterical opposition as in 2002. The System’s ability to demonize opponents has fallen significantly. If she gets 35-40% of the vote, that is still a stinging defeat, but over twice as much as her father. If progress continues.. well, one might at least be able to stop the floodgates before things really get out of hand. A part of me thinks it’s going to be a generational thing: no hope that boomers will overcome their 1960s programming and we’ll have to wait until the Gen X/Millennial “shitlords” gradually work their way to the top. Slow but steady! To paraphrase H L Mencken, those who vote for Macron deserve to get it good and hard. They’ll be squealing soon enough. As an American who very much likes France and wishes it well, I find this inexpressibly saddening, and somewhat surprising. I always knew that the French elites were rotten, traitorous, and short-sighted - almost all elites in the West are - but I always hoped that the French people, if given the chance, would repudiate this nonsense, a la Brexit/Trump. It looks like this was a mistake. Yes, the fish always rots from the head, but the rots also spreads downward, and it looks like this is what has happened here. This was predicted way before (decade, actually) Submission, which is derivative to Elena Chudinova’s The Mosque Of Notre Dame De Paris. Is it possible to read it in English? Yes, the English language version of "The Mosque of Notre Dame De Paris" is cited in Comment #13. It is a very moving, prophetic and dystopian work. Again, whatever happened to No Eurabia? whatever happened to No Eurabia? Steve Sailer and his article on Le Grand Remplacement was very convincing, I think. "Unless something happens." Now it looks like nothing is going to happen. Well, something eventually will, but perhaps not what we all wish for. Yeah, Fillon's immediate endorsement of Macron was very disappointing. He didn't even wait to see how his supporters felt about what he should do as the leftist Melenchon did. Melenchon is a very clever politician, I must add. His economics probably don’t make any sense, I haven’t looked at them, but who cares (other than those of the French who have a lot to lose)? Meanwhile refusing to endorse and letting “the movement” vote is just brilliant: lets him maintain independence and build up true democratic street cred, while preserving some impression of cohesion among his followers and a measure of deniability regardless of who wins. If only that fake socialist Sanders had been so clever! I get the impression that the French centre right and the French centre left have essentially the same position on immigration: whatever is more tactically convenient for them at the moment. It’s not important to them. Why exactly would Fillon endorse Le Pen when he could oppose her while stealing her positions? What would he or his party gain from essentially playing second fiddle to Les Nazis (pardon my nonexistent French)? They’d much rather it was the other way around, and if FN does plateau or decline from here on out, that’s what they’ll get under a Macron presidency, the chance to lead the soft nationalist opposition. I think you’re right the steep upward trend has stalled particularly among the younger segment. However i don’t see any logical reason (apart from higher turnout) why the percentage of people who’d previously voted FN (which given the negative cultural pressure denotes to me they had given up any hope in the existing parties) would shift to Macron unless it was a result of the media creating the illusion that Macron’s party was a) something new and not the uniparty in different clothes and b) provided hope of an easier path to a solution. I can see younger people getting conned by that. So i’m still not black-pilled yet. If correct then “Le Pen vs Goldman Sachs” should work on people who are voting Macron simply out of wishful thinking. I think a lot of us got extremely optimistic with Trump (I certainly did), somehow it felt like perhaps God was on our side, after all. Now it turned out things might not be very much better than they looked two years ago. Yes, the English language version of “The Mosque of Notre Dame De Paris” is cited in Comment #13. It is a very moving, prophetic and dystopian work. I think Smoothie edited it, I couldn't see that yet. I actually searched Amazon, though I think not the US Amazon, and I couldn't find it. I think Smoothie edited it, I couldn’t see that yet. I actually searched Amazon, though I think not the US Amazon, and I couldn’t find it. I think you're right the steep upward trend has stalled particularly among the younger segment. However i don't see any logical reason (apart from higher turnout) why the percentage of people who'd previously voted FN (which given the negative cultural pressure denotes to me they had given up any hope in the existing parties) would shift to Macron unless it was a result of the media creating the illusion that Macron's party was a) something new and not the uniparty in different clothes and b) provided hope of an easier path to a solution. I can see younger people getting conned by that. So i'm still not black-pilled yet. If correct then "Le Pen vs Goldman Sachs" should work on people who are voting Macron simply out of wishful thinking. Yeah I can see why people think that but for some reason I'm still feeling pretty optimistic - not sure why, more a gut feeling than rational i admit. Steve Sailer and his article on Le Grand Remplacement was very convincing, I think. “Unless something happens.” Now it looks like nothing is going to happen. Well, something eventually will, but perhaps not what we all wish for. Yeah I can see why people think that but for some reason I’m still feeling pretty optimistic – not sure why, more a gut feeling than rational i admit. Sounds like a good time to shrug. I agree with . I’m not that pessimistic. Ofc it’s bad that Republicans lost, and this open border guy Macron is worse then current president. I alredy knew Le Pen couldn’t win, Filon was excelent choice. Also French immigration policy was reasonable in the last two decades, expecialy compared to some other counties. There is no mass immigration into France, and that was true for the last three presidents. So I hope Macron don’t change that, and next time right must win, but they also must nominate someone who is hard line anti immigration. I have a bridge in Brooklyn to sell you. Le Pen has reached the point where she now has a much larger electoral potential on the right than she does on the left. She has already picked up all the people on the left that would ever consider voting for her. The rest of them are, for the most part, outside of her reach because they are ideologically committed leftists or center-left people. She is making a mistake by trying to convince them instead of talking more to the right. Indeed, on the other hand, she could get a lot more votes on the right than she currently does, but for that she needs to soften her stance on the economy and the EU. Of course, it would also be a mistake to go too far in that direction because she’d lose the support of many blue-collar workers, but she doesn’t have to. I’m not sure what explains her losses among young people, but I suspect it’s not structural and they don’t vote much anyway. However, I also think she can’t win or at least not be in a position to govern durably without making an alliance with a part of the traditional right, which again requires that she soften her stance on the economy. Has Mélonchon actually now endorsed Macron? Last I heard, he had told his supporters not to vote for Le Pen, but didn’t tell them to vote for Macron. Anatoly, you may be reading too much into the first-round results. I’m sure the reason Le Pen underperformed is because Mélonchon was aggressively (and successfully) courting the same blue-collar types that used to vote socialist/communist back in the day, but now normally vote for the Front. She will win them back in the second round. Unfortunately, it still won’t be enough to beat Macron; but that’s no surprise. Over the past few months, I have never seen a single poll that put Le Pen north of 40% in the second round. That’s still not enough, of course. But it’s nearly double what her father got in 2002. Good news - latest one has her at 41%. I wouldn't overestimate what she'd get from Melenchon. According to the polls I cited, significantly more Fillon voters will vote for her, than Melenchon voters. By the way, I find the poll figures for Brazil on the ‘free’ market very hard to believe. This, after all, is the same country that voted in Partido Trabalhador no less than four times! Are we really to believe that they like capitalism more the US does? And I don’t know who GlobeScan is, but the graphics sure look like those of The Economist, a notoriously neoliberal publication. Yes this is an Economist graphic reprenting a poll. The key thing to bear in mind is that this was done in 2010, when Brazil's economy was doing pretty well. However, France's position in the pro-capitalism ratings is consistently low (see my comment here. By the time the 'Partido dos Trabalhadores' (Workers' Party) started their uninterrupted rule since 2002, the party wasn't left anymore, but center left. Luiz Inácio Lula da Silva started his career on politics as some bum in rags, trying to get his votes from the lower classes and impoverished workers with leftist ideas. By the 21st Century, he took more populist ideas with support for industry and other similar factors, and that's why he was able to win. The recent scandals shows how much his party didn't shy away from selling themselves to the largest companies in the country. Brazil since always has been adopting free market to a level where it strengthened the oligarchic rule and the large corruption in the country has brought all to a state of dysfunctionality even Russia doesn't have. The lower class of Brazil loves welfare, but the middle class hates it, as in any other country. But since the lower classes spend more and work more for less than the middle class, it is them who are favored with lots of welfare policies. And the middle class also benefits somehow with lots of wasteful labor rights too. It's not candidates with right or left ideas that has the favor of the elites anywhere you go in the western world, it's the candidates with centrist ideas. Centrist ideas are fake populism with leftist ideas of social development with right ideas of economic development. I agree with . I'm not that pessimistic. Ofc it's bad that Republicans lost, and this open border guy Macron is worse then current president. I alredy knew Le Pen couldn't win, Filon was excelent choice. Also French immigration policy was reasonable in the last two decades, expecialy compared to some other counties. There is no mass immigration into France, and that was true for the last three presidents. So I hope Macron don't change that, and next time right must win, but they also must nominate someone who is hard line anti immigration. Depends on the definition of "mass". There are I think 200,000 immigrants annually, which is some 0.3% of the population. 65-70,000 of this came from Africa (including the Maghreb), which doesn't sound very much, but they are mostly young (probably includes a lot of bride import by Maghrebis), and so will produce babies quickly. I estimated that even if they only have 2 children per family (I assumed 50% are women, which is probably too high, but is probably offset by the low assumption of only 2 children per woman, also the immigrants might impregnate white French women), they could easily be responsible for a 9 percentage point increase in the nonwhite share of the childbirths. People often don't understand how seemingly small immigration can change the demographic composition. Besides, you don't need immigration, differential birthrates are enough for replacement. Did you not read the post? The generational increase has reversed. 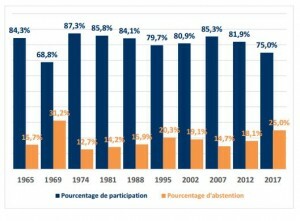 Le Pen got less than 25% of the young vote. And the demographics are not favouring you among the young. I kind of blame Sailer for hyping up FN and France in general as “the place where the next big revolt will come from”. Le Pen has a low but hard ceiling. France was the place of the regressive French revolution. France was where the idea of a “permanent, global revolution” was first formed. Most Marxists loved the French revolution for this reason meanwhile Burke and other sane people accordingly threw acid on it. France has produced one Marxist philosopher after the other in the past century. It had no Heidegger, no Schmitt or even a serious liberal tradition after 1900. France is really the birthplace of ‘muh civic nationalism’ in the modern era mixed in with heaps of communism. Sartre, Derrida and all the other cancerous communists all came from France. It was always foolish to expect them to change. Honestly, even Germany could change faster at this pace. France was the place of the progressive French revolution. Excellent comment, I took the liberty of correcting the one typo. Macron is on page with the top thinker in France (Grahame Harman thinks Bruno Latour, who scored the highest marks in the country on his school philosophy exam, is the most important living philosopher. Harman's book on Latour's political philosophy: Both truth or power are employed by turns to efface the always uncertain play of political networks, in which rhetoric and proof, strength and weakness, all stand on the same footing. [...] There is a lazy tendency in our era to moralize every political issue, as if politics were merely the implementation of an already understood justice, rather than –as Latour holds– the place where the nature of justice is determined. Someone is always held to be morally at fault whenever a political situation goes wrong; politics becomes an actual knowledge of the morally right, whose truth is opposed only by those corrupted through inferior character or vested interests. Schmitt is certainly a good antidote to this customary excess: for Schmitt, the political begins only where the posturing over right and wrong ends. The enemy is declared, but the enemy is only to be defeated rather than dehumanized and annihilated. Schmitt is invoked in Latour’s Gifford Lectures because climate change skeptics have become the enemy with whom we can longer reason, and with whom we are locked in existential struggle in our effort to compose Gaia. Ever since the American elections of November 2016 things have become clearer. Europe is being dismembered: it counts less than a hazelnut in a nutcracker. And this time around, it can no longer rely on the United States to fix anything. The enlightened elites — they do exist — realized, after the 1990s, that the dangers summed up in the word “climate” were increasing. Until then, human relationships with the earth had been quite stable. It was possible to grab a piece of land, secure property rights over it, work it, use it, and abuse it. The land itself kept more or less quiet. The enlightened elites soon started to pile up evidence suggesting that this state of affairs wasn’t going to last. But even once elites understood that the warning was accurate, they did not deduce from this undeniable truth that they would have to pay dearly.[...] And it goes without saying that “ordinary folk” shouldn’t have too many illusions about how the venture is going to turn out. You don’t need to be very bright to foresee that the whole thing will end in a terrible conflagration. This is the only real parallel with the different fascisms. The challenge to be met is tailor-made for Europe, since it is Europe that invented the strange story of globalization and then became one of its victims. History will belong to those who can be the first to come to earth, to land on an earth that can be inhabited — unless the others, the dreamers of old-style realpolitik, have finally made that earth vanish for good. Macron represents a self confident intellectual tradition seeing itself as the "standard bearer of western secular liberalism". Far from being disconcerted by massacring by Muslims/ refugees , the Marcon (he has banned Russian media from his events) tendency sees terrorist attacks as a confirmation of France's supremely enlightened status. Macron's France believes has all the answers to global warming , it practice it will probably be along the lines of the new Hinkley Point nuclear reactor in England, which being built by a French company with the Chinese taking a big stake . May is a little better that her idiot predecessors, as Home Secretary she was against relaxing visa restriction for Chinese businessmen but got overruled by Osborne who also gave the Chinese billions in guarantees. As PM she delayed the OK for Hinkley Point . What possible national security concerns could their be in letting China in on the power supply in Britain? As for the climate change warrior French, just a few years ago that French company built a gas fired power station in Britain, and they not only built it with foreign labour, they brought the cement from abroad, not energy efficient but cheaper I suspect. So expect Macron's France to talk a load of high minded rubbish while pursuing maximum profit at the commons people's expense. Anatoly, you may be reading too much into the first-round results. I'm sure the reason Le Pen underperformed is because Mélonchon was aggressively (and successfully) courting the same blue-collar types that used to vote socialist/communist back in the day, but now normally vote for the Front. She will win them back in the second round. Unfortunately, it still won't be enough to beat Macron; but that's no surprise. 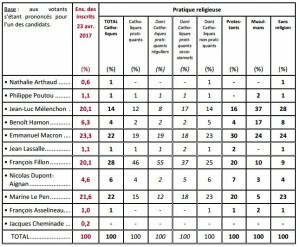 Over the past few months, I have never seen a single poll that put Le Pen north of 40% in the second round. That's still not enough, of course. But it's nearly double what her father got in 2002. Good news – latest one has her at 41%. I wouldn’t overestimate what she’d get from Melenchon. According to the polls I cited, significantly more Fillon voters will vote for her, than Melenchon voters. Although Marlière is urging a 'lesser evil' vote for Macron, he fears that voter apathy may give Le Pen a boost, perhaps enough to win. Shades of Brexit, Trump. By the way, I find the poll figures for Brazil on the 'free' market very hard to believe. This, after all, is the same country that voted in Partido Trabalhador no less than four times! Are we really to believe that they like capitalism more the US does? And I don't know who GlobeScan is, but the graphics sure look like those of The Economist, a notoriously neoliberal publication. The key thing to bear in mind is that this was done in 2010, when Brazil’s economy was doing pretty well. However, France’s position in the pro-capitalism ratings is consistently low (see my comment here. True, the real subject of the discussion is France. I guessed I fixated on Brazil because some of the commenters above mentioned it, and I found the statistic hard to believe. Depends on the definition of “mass”. There are I think 200,000 immigrants annually, which is some 0.3% of the population. 65-70,000 of this came from Africa (including the Maghreb), which doesn’t sound very much, but they are mostly young (probably includes a lot of bride import by Maghrebis), and so will produce babies quickly. I estimated that even if they only have 2 children per family (I assumed 50% are women, which is probably too high, but is probably offset by the low assumption of only 2 children per woman, also the immigrants might impregnate white French women), they could easily be responsible for a 9 percentage point increase in the nonwhite share of the childbirths. People often don’t understand how seemingly small immigration can change the demographic composition. Besides, you don’t need immigration, differential birthrates are enough for replacement. Even if some official French source has published such figures, I'm sure they are no more reliable than their British counterparts are shown to be by the census. Conveniently, France not only doesn't collect ethnic statistics, but hasn't even carried out a census since 1999. The FN has a loyal blue collar supporter base, but there is no bridge to the wider society. In that respect the FN is very like the 80’s French Communist party . The Euro-communist (Italian and Parti communiste français) theoreticians identified immigration as a transparent attempt to create a larger reserve army of unemployed workers to keep the price of labour down. Patrick Cathala is in an even more precarious position. Five years ago he lost his construction job, and he too regards himself as a victim of Europe’s open-border policies. According to the EU those Poles ect taking jobs in France are not immigrants because their homeland is in the EU. Marine LePen’s problem is that her support is the people affected by this kind of immigration, so she has to, absolutely has to, be against free movement within the EU, which amounts to being against the whole thing. But the EU as a whole is the only way out for the French elite (with bankers at its core), the French economy like others in Europe is going to be run on a low wage army of immigration. The EU is about the slowest growing area in the world, with unemployment among the young at 25 per cent in France and 40 per cent in Italy and Spain. In Britain the out vote was made mainly by working class opponents of EU immigrants keeping wages low, yet the Brexiteers you’ll hear are business-libertarian ideologues who like hard working immigrants as ingredients in free market. No voice is demanding that the millions in Poles ect in and still arriving in large numbers in Britain through EU free movement get sent back . Writing in Tribune in 1943 after reviewing a batch of “progressive” books, George Orwell observed: “I was struck by the automatic way in which people go on repeating certain phrases that were fashionable before 1914. Two great favourites are ‘the abolition of distance’ and ‘the disappearance of frontiers’.” More than 70 years later, the same empty formulae are again being repeated. At present, the liberal mind can function only to the extent that it shuts out reality. The low wage army of immigration is one of the two main reasons *why* the EU economy is stagnant. Mass immigration puts downward pressure on wages and upward pressure on housing costs which squeezes disposable income thus causing stagnant demand. It's true that big business *believes* driving wages down to subsistence makes economic sense but it doesn't because if people don't have any spending money then you don't have an economy. So there is a capitalist economic argument against mass immigration as well as a more socialist one. By the time the ‘Partido dos Trabalhadores’ (Workers’ Party) started their uninterrupted rule since 2002, the party wasn’t left anymore, but center left. Luiz Inácio Lula da Silva started his career on politics as some bum in rags, trying to get his votes from the lower classes and impoverished workers with leftist ideas. By the 21st Century, he took more populist ideas with support for industry and other similar factors, and that’s why he was able to win. The recent scandals shows how much his party didn’t shy away from selling themselves to the largest companies in the country. Brazil since always has been adopting free market to a level where it strengthened the oligarchic rule and the large corruption in the country has brought all to a state of dysfunctionality even Russia doesn’t have. The lower class of Brazil loves welfare, but the middle class hates it, as in any other country. But since the lower classes spend more and work more for less than the middle class, it is them who are favored with lots of welfare policies. And the middle class also benefits somehow with lots of wasteful labor rights too. It’s not candidates with right or left ideas that has the favor of the elites anywhere you go in the western world, it’s the candidates with centrist ideas. Centrist ideas are fake populism with leftist ideas of social development with right ideas of economic development. Although Marlière is urging a ‘lesser evil’ vote for Macron, he fears that voter apathy may give Le Pen a boost, perhaps enough to win. Shades of Brexit, Trump. I kind of blame Sailer for hyping up FN and France in general as "the place where the next big revolt will come from". Le Pen has a low but hard ceiling. France was the place of the regressive French revolution. France was where the idea of a "permanent, global revolution" was first formed. Most Marxists loved the French revolution for this reason meanwhile Burke and other sane people accordingly threw acid on it. France has produced one Marxist philosopher after the other in the past century. It had no Heidegger, no Schmitt or even a serious liberal tradition after 1900. France is really the birthplace of 'muh civic nationalism' in the modern era mixed in with heaps of communism. Sartre, Derrida and all the other cancerous communists all came from France. Harman’s book on Latour’s political philosophy: Both truth or power are employed by turns to efface the always uncertain play of political networks, in which rhetoric and proof, strength and weakness, all stand on the same footing. […] There is a lazy tendency in our era to moralize every political issue, as if politics were merely the implementation of an already understood justice, rather than –as Latour holds– the place where the nature of justice is determined. Someone is always held to be morally at fault whenever a political situation goes wrong; politics becomes an actual knowledge of the morally right, whose truth is opposed only by those corrupted through inferior character or vested interests. Schmitt is certainly a good antidote to this customary excess: for Schmitt, the political begins only where the posturing over right and wrong ends. The enemy is declared, but the enemy is only to be defeated rather than dehumanized and annihilated. Schmitt is invoked in Latour’s Gifford Lectures because climate change skeptics have become the enemy with whom we can longer reason, and with whom we are locked in existential struggle in our effort to compose Gaia. The enlightened elites soon started to pile up evidence suggesting that this state of affairs wasn’t going to last. But even once elites understood that the warning was accurate, they did not deduce from this undeniable truth that they would have to pay dearly. […] And it goes without saying that “ordinary folk” shouldn’t have too many illusions about how the venture is going to turn out. You don’t need to be very bright to foresee that the whole thing will end in a terrible conflagration. This is the only real parallel with the different fascisms. Macron represents a self confident intellectual tradition seeing itself as the “standard bearer of western secular liberalism”. Far from being disconcerted by massacring by Muslims/ refugees , the Marcon (he has banned Russian media from his events) tendency sees terrorist attacks as a confirmation of France’s supremely enlightened status. Macron’s France believes has all the answers to global warming , it practice it will probably be along the lines of the new Hinkley Point nuclear reactor in England, which being built by a French company with the Chinese taking a big stake . May is a little better that her idiot predecessors, as Home Secretary she was against relaxing visa restriction for Chinese businessmen but got overruled by Osborne who also gave the Chinese billions in guarantees. As PM she delayed the OK for Hinkley Point . What possible national security concerns could their be in letting China in on the power supply in Britain? As for the climate change warrior French, just a few years ago that French company built a gas fired power station in Britain, and they not only built it with foreign labour, they brought the cement from abroad, not energy efficient but cheaper I suspect. So expect Macron’s France to talk a load of high minded rubbish while pursuing maximum profit at the commons people’s expense. The FN has a loyal blue collar supporter base, but there is no bridge to the wider society. In that respect the FN is very like the 80's French Communist party . The Euro-communist (Italian and Parti communiste français) theoreticians identified immigration as a transparent attempt to create a larger reserve army of unemployed workers to keep the price of labour down. French National Front: Far right or hard left? Roger Denis, a 41-year-old haulier from the eastern city of Nancy, feels his job is threatened. "My company uses a lot of Polish drivers," he says. "I have nothing against them, but they are working for 800 euros a month (£650; $1,100). They have Polish number plates, but of course they work in France." Patrick Cathala is in an even more precarious position. 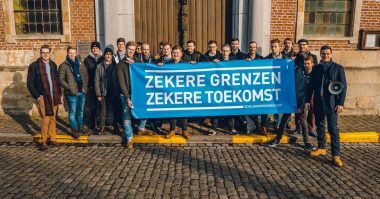 Five years ago he lost his construction job, and he too regards himself as a victim of Europe's open-border policies. "I'm unemployed because firms prefer to hire workers from Romania, Bulgaria, Portugal or Spain. They're letting all those people in. What am I supposed to do?" According to the EU those Poles ect taking jobs in France are not immigrants because their homeland is in the EU. Marine LePen's problem is that her support is the people affected by this kind of immigration, so she has to, absolutely has to, be against free movement within the EU, which amounts to being against the whole thing. But the EU as a whole is the only way out for the French elite (with bankers at its core), the French economy like others in Europe is going to be run on a low wage army of immigration. The EU is about the slowest growing area in the world, with unemployment among the young at 25 per cent in France and 40 per cent in Italy and Spain. In Britain the out vote was made mainly by working class opponents of EU immigrants keeping wages low, yet the Brexiteers you'll hear are business-libertarian ideologues who like hard working immigrants as ingredients in free market. No voice is demanding that the millions in Poles ect in and still arriving in large numbers in Britain through EU free movement get sent back . It’s true that big business *believes* driving wages down to subsistence makes economic sense but it doesn’t because if people don’t have any spending money then you don’t have an economy. A capitalistic country would I suppose be run for the benefit of the people as a whole not the top tier of it. While it is true what you say about the housing market, I'm not sure you are making the common masses' purchasing power sound more indispensable than it actually is, because the elite may get be getting massively more purchasing power as the masses lose it. Marine Le Pen got just 4.0% of the vote in the 11th arrondissement of Paris in the first round of the French Presidential elections.... It is an elite central district, where the average house costs about 10,000 Euros per square meter, and hosts relatively few Arab-African immigrants. It also hosts the Bataclan theater, the site of the worst terrorist attack in Western Europe in the past decade. Even the most impoverished countries in the world have a super rich elite, with more than enough disposable income to support a national serve-the-rich economy. If the problem is immigration induced wage deflation, and the answer is wage inflation, wouldn't the wage inflation spur goods/services price inflation? Wouldn't it be a wash overall? A capitalistic country would I suppose be run for the benefit of the people as a whole not the top tier of it. While it is true what you say about the housing market, I’m not sure you are making the common masses’ purchasing power sound more indispensable than it actually is, because the elite may get be getting massively more purchasing power as the masses lose it. Marine Le Pen got just 4.0% of the vote in the 11th arrondissement of Paris in the first round of the French Presidential elections…. It is an elite central district, where the average house costs about 10,000 Euros per square meter, and hosts relatively few Arab-African immigrants. That's correct - but conservative *parties* need more voters than the top 1-2%. The neo-liberal agenda (off-shoring, mass immigration, debt-based consumption) has stagnated the western economies from the bottom up, first low-skilled then manual skilled and now creeping into the white collar demographic. You're right that the top end of conservative voters - GOPe - are doing well and will be the last to be swallowed by the crocodile but the lower half to 2/3 of conservative voters are already having their toes nibbled. Neoliberal economics can't work because its foundation is the capitalist paradox: each firm's wage bill is a big part of their costs but the sum of every firm's wage bill is where each firm's revenue comes from - so if every firm drives down wages then they all kill their revenue. So the material conditions dictate that the conservative vote will crumble at some point and there's only one way they can go. No, because the super-rich don't spend most of their money, they save too much. While the poor only spend on basic necessities and bad habits like cigarettes. Only the middle class will spend most of its income on high value-added things which will generate growth. Even if some official French source has published such figures, I’m sure they are no more reliable than their British counterparts are shown to be by the census. Conveniently, France not only doesn’t collect ethnic statistics, but hasn’t even carried out a census since 1999. As I wrote, the numbers published look small, but actually mean massive replacement. The official numbers of course don't count illegal immigration, which must exist, and is difficult to measure. That’s correct – but conservative *parties* need more voters than the top 1-2%. You’re right that the top end of conservative voters – GOPe – are doing well and will be the last to be swallowed by the crocodile but the lower half to 2/3 of conservative voters are already having their toes nibbled. Neoliberal economics can’t work because its foundation is the capitalist paradox: each firm’s wage bill is a big part of their costs but the sum of every firm’s wage bill is where each firm’s revenue comes from – so if every firm drives down wages then they all kill their revenue. So the material conditions dictate that the conservative vote will crumble at some point and there’s only one way they can go. The official numbers of course don’t count illegal immigration, which must exist, and is difficult to measure. No, because the super-rich don’t spend most of their money, they save too much. While the poor only spend on basic necessities and bad habits like cigarettes. Only the middle class will spend most of its income on high value-added things which will generate growth. I very much doubt that capitalist markets are self-regulating systems that will deliver stable growth as long as government does not interfere. So I don't accept that there is an inherent spending power value added or otherwise in an economy. Growth is hence very far from the natural consequence of just letting a native labour market run without outside interference. Stopping immigration isn't going to solve economic problems so easily, and in fact it might well cause problems because so many countries' business class demand it and will fight to keep it. Government is going to interfere to benefit its constituency. Allowing immigration (free movement) within the EU is central to the economic concept of the EU. The reason for the brexit vote was desire for curtailing EU immigration into Britain, by a still inchoate working class mass against it. But almost all the political, business and economic professionals' opinion in Britain is formed up for continuing immigration of workers from the EU. The working class will have to make themselves heard, and get to be a constituency for a government to interfere for them. Brexit is only the beginning of the battle, which will be continuing for a generation I suspect. If Italy comes out the EU and says what everyone knows (that Italy, with no rise in living standards since 2000 is never going to take more pain to repay the loans it got from greedy French bankers) the people who currently count in France, being the constituency of president Marcon, will need the German taxpayers to bail out French banks. So in France stopping immigration has all the problems that are still to be tackled in Britain and a huge additional one of France's hyper-capitalist beggars (vital to the national economy) being in control through their man Macron. I'll say it again, capitalism in a nation state or the EU or the world can not in principle run smoothly in the way you suggest. Government has to interfere and they don't solve much overall but do helpr their own constituency. The richer you are, the more likely you are going to save money. The super-rich likes to pamper the poor because they spend on everything, even if they don't have money, that's why there's credit. It is also the case of low-skilled immigrants or the ones who would content themselves with manual labor or mediocre office work. They don't care at all if they realize later it is as difficult or even more than that to earn a living on foreign lands than in their homeland or if they are going to earn meager wages, as long as they have more choices to waste their money and a functional society where they won't feel threated by violence and supported by a generous welfare when necessary, the better. They opt to live a mediocre, immediatist, materialistic life as long as they can, the true nature of the debt slave life. It's different from many middle class people that projects goals for the future. That's why even in homogeneous and really productive countries (not elitist and fragile oil and banker countries) like Japan, Taiwan or South Korea it's more likely for the government and companies nowadays to accept the unskilled and "not too keen to assimilate" immigrants than proper educated, independant and commited ones that would even scrap away their original citizenship if given the option to be accepted. I very much doubt that capitalist markets are self-regulating systems that will deliver stable growth as long as government does not interfere. So I don’t accept that there is an inherent spending power value added or otherwise in an economy. Growth is hence very far from the natural consequence of just letting a native labour market run without outside interference. Stopping immigration isn’t going to solve economic problems so easily, and in fact it might well cause problems because so many countries’ business class demand it and will fight to keep it. Government is going to interfere to benefit its constituency. Allowing immigration (free movement) within the EU is central to the economic concept of the EU. The reason for the brexit vote was desire for curtailing EU immigration into Britain, by a still inchoate working class mass against it. But almost all the political, business and economic professionals’ opinion in Britain is formed up for continuing immigration of workers from the EU. The working class will have to make themselves heard, and get to be a constituency for a government to interfere for them. Brexit is only the beginning of the battle, which will be continuing for a generation I suspect. If Italy comes out the EU and says what everyone knows (that Italy, with no rise in living standards since 2000 is never going to take more pain to repay the loans it got from greedy French bankers) the people who currently count in France, being the constituency of president Marcon, will need the German taxpayers to bail out French banks. So in France stopping immigration has all the problems that are still to be tackled in Britain and a huge additional one of France’s hyper-capitalist beggars (vital to the national economy) being in control through their man Macron. I’ll say it again, capitalism in a nation state or the EU or the world can not in principle run smoothly in the way you suggest. Government has to interfere and they don’t solve much overall but do helpr their own constituency. It would increase domestic demand almost immediately. because so many countries’ business class demand it and will fight to keep it. that is the current problem, the business class driving down wages and then scratching their heads over where their revenue went. Wow, Le Pen got endorsement of Nicholas Dupont-Aignan, a Gaullist candidate who won 4.7% of the first round vote. This won’t change the outcome, but a good sign of some defections from the establishment camp. Nicholas Dupont-Aignan is not establishment. It is not "left vs right but nationalism vs globalism". It is establishment vs anti-establishments. Note how the main candidates of the anti-establishment left, Mélenchon and Lassalle refused to endorse the establishment candidate Macron. They took a third option. Wow, Le Pen got endorsement of Nicholas Dupont-Aignan, a Gaullist candidate who won 4.7% of the first round vote. This won't change the outcome, but a good sign of some defections from the establishment camp. The richer you are, the more likely you are going to save money. The super-rich likes to pamper the poor because they spend on everything, even if they don’t have money, that’s why there’s credit. It is also the case of low-skilled immigrants or the ones who would content themselves with manual labor or mediocre office work. They don’t care at all if they realize later it is as difficult or even more than that to earn a living on foreign lands than in their homeland or if they are going to earn meager wages, as long as they have more choices to waste their money and a functional society where they won’t feel threated by violence and supported by a generous welfare when necessary, the better. They opt to live a mediocre, immediatist, materialistic life as long as they can, the true nature of the debt slave life. It’s different from many middle class people that projects goals for the future. That’s why even in homogeneous and really productive countries (not elitist and fragile oil and banker countries) like Japan, Taiwan or South Korea it’s more likely for the government and companies nowadays to accept the unskilled and “not too keen to assimilate” immigrants than proper educated, independant and commited ones that would even scrap away their original citizenship if given the option to be accepted. It is not “left vs right but nationalism vs globalism”. If the problem is immigration induced wage deflation, and the answer is wage inflation, wouldn’t the wage inflation spur goods/services price inflation? Wouldn’t it be a wash overall? I wouldn't say there's a solution exactly. I'd say it's more a case of sailing between two reefs whereas currently and for a long while we've been sailing directly at one of them. I wouldn’t say there’s a solution exactly. I’d say it’s more a case of sailing between two reefs whereas currently and for a long while we’ve been sailing directly at one of them. Slightly OT, but if somehow Le Pen was elected could she do much on her own as President, without a cooperative National Assembly? I believe the French President can call for referenda on major issues. Could she not do something like what Fillon was proposing and have some immigration related referenda called, in addition to EU related votes. This would seem to me to be a much bigger power platform than what is available to Trump.